Vapor ablation therapy for treating emphysema has undergone more than 10 years of research and development. The culmination of these efforts has resulted in the groundbreaking STEP-UP study. The STEP-UP study is a multi-national, multi-center, randomized controlled study with long term follow-up. Six countries participated in the STEP-UP study. Uptake Medical initiated this most rigorous form of randomized study to ensure that the results published best represent the outcomes expected when the product is used in a variety of settings. Single-center randomized controlled trials run the risk of not accurately reflecting the true outcomes when the product is used in multiple hospitals and countries. Lung volume reduction of emphysematous lobes results in clinical improvement for patients with severe emphysema. However, some segments within a lobe are often substantially more diseased than others, thereby warranting a more targeted approach of the emphysematous parts of a lobe. We therefore did a study to assess whether or not selective sequential treatment of the more diseased upper lobe segments with bronchoscopic vapour ablation led to clinical improvement. For the multicentre, parallel-group, randomised, controlled, open-label Sequential Staged Treatment of Emphysema with Upper Lobe Predominance (STEP-UP) trial, adult patients aged 45–75 years with severe, upper lobe-predominant emphysema with a forced expiratory volume in 1 s (FEV1) between 20% and 45%, substantial hyperinflation, and post-rehabilitation 6-min walk test (6MWT) greater than 140 m were enrolled from 13 hospital sites in Europe (ten sites) and Australia (three sites). A computer-generated blocked randomisation scheme (block size three per site based on a random table from an independent biostatistician) stratified by site was used to randomly assign enrolled patients 2:1 to segmental vapour ablation (treatment group) or standard medical management (control group). Patients and investigators were not masked to group assignment. The primary efficacy endpoints were statistically significant changes in FEV1 and St George's Respiratory Questionnaire (SGRQ-C) scores between trial groups at 6 months, analysed by intention to treat. This study is registered with ClinicalTrials.gov, number NCT01719263. Between June 30, 2013, and Oct 1, 2014, 134 patients were screened and 70 were enrolled and randomly assigned: 46 to the treatment group and 24 to the control group. One patient in the treatment group did not receive treatment because of physician decision post-randomisation; this patient is excluded from all analyses. The mean relative improvement in FEV1 between the treatment group versus the control group was 14·7% (95% CI 7·8–21·5%; p<0·0001) and in SGRQ-C was −9·7 points (95% CI −15·7 to −3·7; p=0·0021). COPD exacerbation was the most common serious adverse event, occurring in 11 (24%) of 45 patients in the treatment group and one (4%) of 24 in the control group. One exacerbation resulted in a patient death 84 days after treatment; this was judged by the data and safety monitoring board to be possibly related to treatment. No pneumothorax occurred within 30 days of treatment. Compared with standard medical management, targeted thermal vapour ablation of more diseased segments and preservation of less diseased segments resulted in clinically meaningful and statistically significant improvements in lung function and quality of life at 6 months, with an acceptable safety profile. We previously reported the 6 month results of the STEP-UP randomised controlled trial (segmental volume reduction with thermal vapour ablation in patients with severe emphysema). Quantitative analysis of high resolution CT (HRCT) revealed that most patients with emphysema have segments within lobes that are much healthier compared with other segments within the lobe and ipsilateral lung.2 Lung volume reduction with thermal vapour ablation uniquely allows a targeted approach of just the more diseased segments. Emphysema patients with collateral ventilation (CV) will not benefit from valve therapy, the most common endoscopic lung volume reduction procedure. A recent randomized controlled trial (STEP-UP) of the alternative bronchoscopic thermal vapor ablation (BTVA) included patients with (CV+) and without interlobar CV (CV–). This analysis evaluated the efficacy and safety of the CV+ population following BTVA. Method: A post hoc fissure analysis of the baseline computed tomography of all treatment and control patients was performed with the VIDA Diagnostics Apollo software. A patient was considered to be CV+ if either of the treated upper lobes was adjacent to a fissure that was <90% complete. The primary endpoints, forced expiratory volume in 1 s (FEV 1) and St. George’s Respiratory Questionnaire (SGRQ-C), were calculated for these CV+ patients following BTVA and safety results summarized. 78% (35/45) of the patients in the treatment arm and 79% (19/24) of the patients in the control arm were found to be CV+. At 12 months, the FEV 1 improvement of the treatment arm was 9.2%, as compared with a decrease of 5.4% in the control group, resulting in a mean between-group difference of 14.6% (p = 0.0137). The improvement in SGRQ-C of the treatment arm as compared to the control arm was 8.4 points (p = 0.0712). An increase in respiratory related serious adverse events was observed immediately following treatment, but most resolved with routine care. BTVA can achieve safe and clinically meaningful improvement in pulmonary function and quality of life in patients with CV. These randomized controlled trial subgroup results offer proof of a viable solution for CV+ patients. 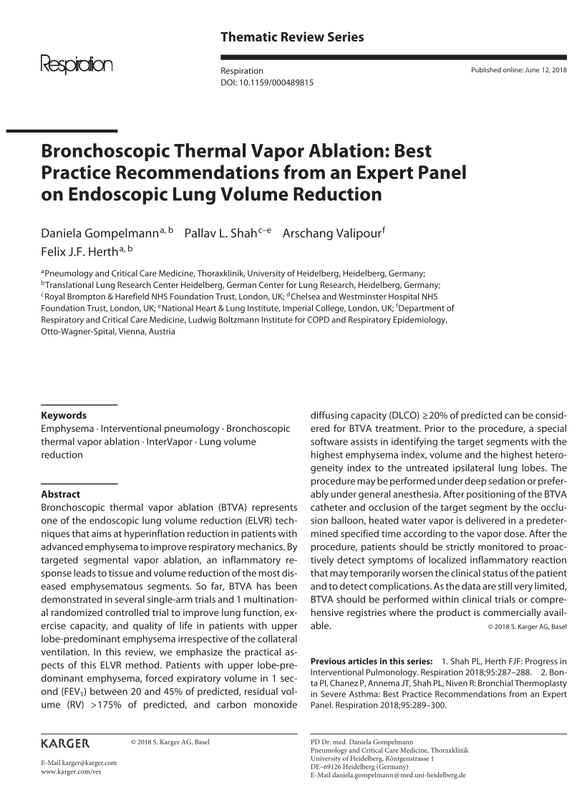 Bronchoscopic thermal vapor ablation (BTVA) represents one of the endoscopic lung volume reduction (ELVR) techniques that aims at hyperinflation reduction in patients with advanced emphysema to improve respiratory mechanics. By targeted segmental vapor ablation, an inflammatory response leads to tissue and volume reduction of the most diseased emphysematous segments. So far, BTVA has been demonstrated in several single-arm trials and 1 multinational randomized controlled trial to improve lung function, exercise capacity, and quality of life in patients with upper lobe-predominant emphysema irrespective of the collateral ventilation. In this review, we emphasize the practical aspects of this ELVR method. Patients with upper lobe-predominant emphysema, forced expiratory volume in 1 second (FEV1) between 20 and 45% of predicted, residual volume (RV) > 175% of predicted, and carbon monoxide diffusing capacity (DLCO) ≥20% of predicted can be considered for BTVA treatment. Prior to the procedure, a special software assists in identifying the target segments with the highest emphysema index, volume and the highest heterogeneity index to the untreated ipsilateral lung lobes. The procedure may be performed under deep sedation or preferably under general anesthesia. After positioning of the BTVA catheter and occlusion of the target segment by the occlusion balloon, heated water vapor is delivered in a predetermined specified time according to the vapor dose. After the procedure, patients should be strictly monitored to proactively detect symptoms of localized inflammatory reaction that may temporarily worsen the clinical status of the patient and to detect complications. As the data are still very limited, BTVA should be performed within clinical trials or comprehensive registries where the product is commercially available.